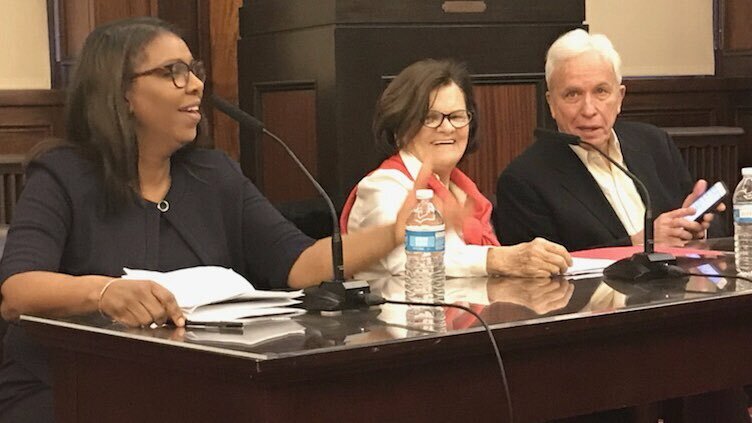 Former and current New York City elected officials broadly praised the city’s campaign finance system at a panel at New York Law School on Wednesday, while acknowledging that it could be improved to incentivize more reliance on small donors and streamlined to encourage first-time candidates to run for office. 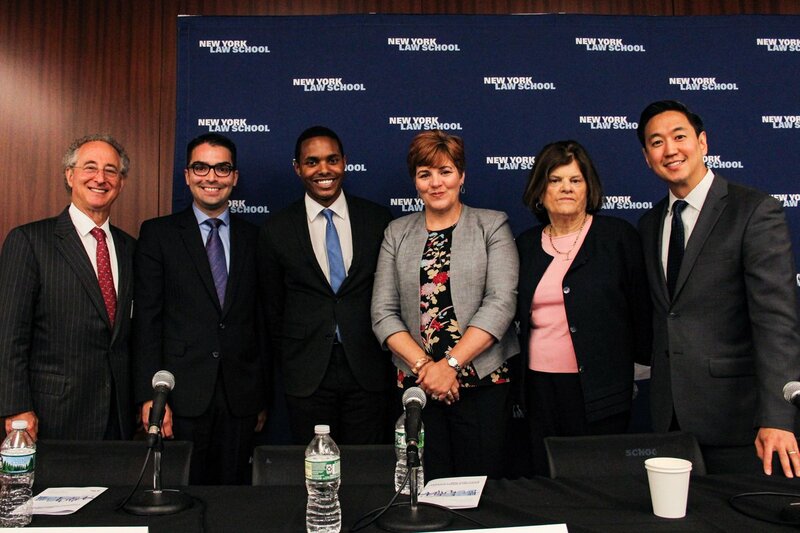 The panel was hosted by the New York City Campaign Finance Board (CFB) and moderated by Daniel Cho, assistant executive director for candidate guidance and policy at the CFB. The panellists included sitting City Council Members Ritchie Torres and Eric Ulrich, former City Council Speaker Christine Quinn, and former Public Advocate Betsy Gotbaum, who shared their divergent experiences in running for elected office, raising campaign money, and navigating the city’s campaign finance program. The CFB administers the system and its widely lauded public matching funds program, which intends to level the playing field in elections by matching the first $175 of every qualifying contribution at a 6-to-1 ratio. The rationale is simple: It motivates candidates for local and citywide office to cast a wider net and seek smaller individual donors rather than depend on wealthy contributors giving larger donations. But, even as other jurisdictions have begun to model programs after New York City’s, the CFB is hoping to strengthen its system, further limit the size of maximum donations, and encourage pursuit of small donors, recommending a slew of reforms for consideration by Mayor Bill de Blasio’s charter revision commission, which will soon announce the proposals it will put before voters on November’s Election Day. CFB Chair Rick Schaffer gave opening remarks before the panel, during which he outlined the history of the campaign finance program and the CFB's new recommendations. Those reforms include drastically lowering contribution limits, increasing the matching fund ratio to 8-to-1 and the value of matchable donations to $250, changing the thresholds for qualifying for matching funds -- including the addition of a geographic requirement where a citywide candidate would have to get at least 50 donations from each borough -- and lowering the minimum qualifying contribution from $10 to $5. In the coming weeks, the charter commission will issue its final report, and the proposals it lands on will be presented to voters on the November general election ballot. Council Member Ulrich, a Republican from Queens, said the matching fund system was instrumental in his special election campaign in 2009, which he ran without help from labor unions or the local party establishment. “The critical factor in me deciding to move forward and to run was in fact the campaign finance program,” he said. Torres, a Bronx Democrat, similarly said the program gave him “sufficient resources” to run his City Council campaign in 2013, but with one caveat. “The cost of running a campaign seems to vary widely from Council district to Council district.You could win a district like mine on the sheer strength of door-to-door campaigning,” he said. Quinn -- who is the only mayoral candidate to ever max out on public matching funds, Cho later said -- subsequently noted that rent for campaign offices in particular is one cost that can be drastically different depending on the district. Gotbaum, who is now executive director of government reform group Citizens Union, said that when she ran for public advocate in 2001, she raised large numbers of maximum donations -- currently $5,100 for citywide candidates -- because of a crowded field and because the CFB’s matching funds tend to be doled out late in the campaign. The program does appear to serve its intended purpose better for City Council candidates as citywide candidates continue to raise a majority of their funds from large donors. Gotbaum supports the public funds program but worries about the public reaction to the cost of public financing if the matching amounts are raised, though she also acknowledged that not enough New Yorkers even know the program exists. “I think if you put the match up terribly high, those few people that participate may start to complain...I’m just throwing that out there as a point of discussion,” she said. All the panellists agreed that a big challenge to ensuring ordinary voices are reflected in elections is that voter participation and engagement is far too anaemic in New York City. They not only stressed the need for more voter education but also the dire necessity of reforming the state’s antiquated voting and election laws which are widely held responsible for low voter turnout. Ulrich’s Republican colleagues who control the state Senate have not had the same opinion, however, as the chamber has opposed most campaign finance reforms supported by the Democratic Assembly and Governor Andrew Cuomo, as well as most voting and election reforms. Quinn took particular issue with state election law’s LLC loophole, which allows hidden donors to legally circumvent the already high state contribution limits through multiple limited liability companies. As Council speaker, Quinn ushered in campaign finance reforms which included a prohibition against LLC donations in city elections. She also said the practice of intermediaries “bundling” donations from several contributors for a single candidate tend to be more corrupting than a single, maxed-out donation. “That’s really where the amplification of corporate interests comes into place,” she said, urging the CFB to go beyond simply lowering contribution limits. Torres also wanted to see “bolder” reforms. “Some of these improvements do feel incremental,” he said, pointing out the heavy reliance on large donors, particularly in the mayoral race. He wants to see a drastic reduction in the contribution limits. “I think it would create a system that is purely powered by small donations,” he said. The Council member also noted that the recent victory of Alexandria Ocasio-Cortez -- who ran on a platform opposed to corporate donors -- over Democratic Rep. Joe Crowley in the June congressional primary shows a “millennial outcry” against excessive money in politics. “If the mayor’s charter commission were to radically reduce contribution limits in response to the national zeitgeist that’s taking hold, I think it would be a legacy achievement for the mayor,” he said. The panellists also agreed that perception matters in politics, and that constituents need to be reassured that government is not for sale, with some discussion around the “doing-business” limits on donations from entities seeking or holding city contracts. The Public Advocate’s office was created in 1993 to give a voice to everyday New Yorkers and act as checks on the authority of the Mayor and the function of city agencies. 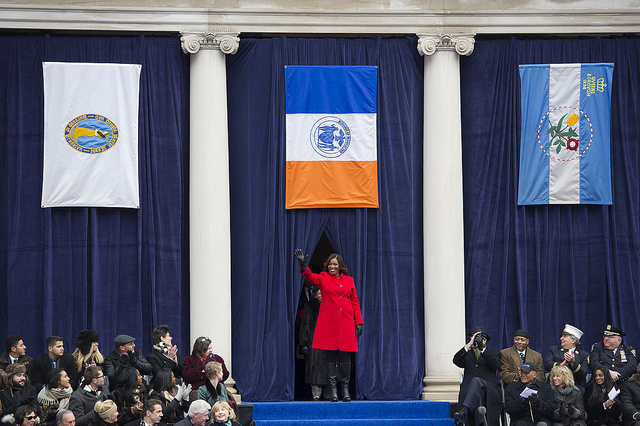 Letitia James, the fourth New York City Public Advocate, has made litigation a major tool in her attempt to fulfill the office’s mandates. James, who has a background as an attorney and has hired several lawyers to her staff since taking office in 2014, has fought the city and its agencies in the courts with mixed success. James’ aggressive use of litigation has raised the question of what legal standing the Public Advocate has on behalf of all New Yorkers. After multiple occasions where she was either bumped from lawsuits for lack of standing or she withdrew, within the last few weeks James declared victory in two cases where judges recognized her capacity to sue the city. The decisions have served to embolden James in her commitment to legal action and also possibly set a precedent for the powers of her office. 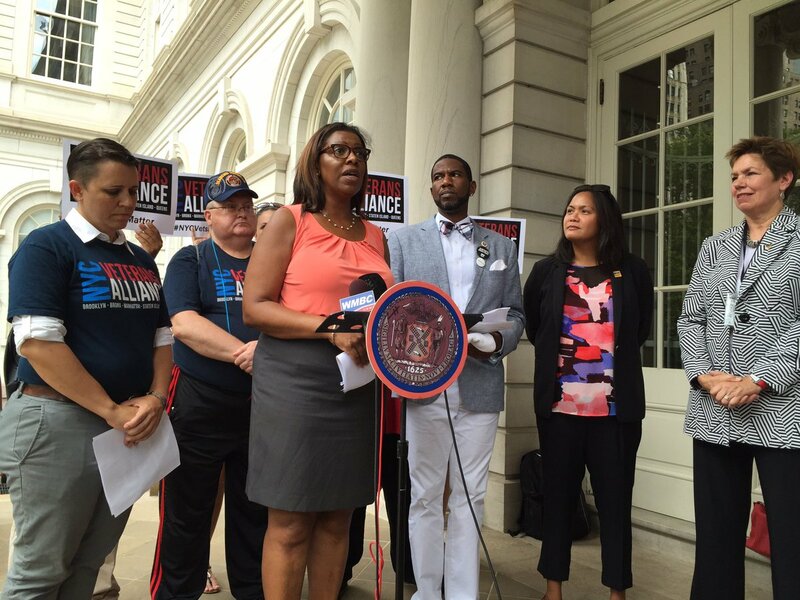 The debate and the proceedings over the legal powers of the Public Advocate are far from over, though, as the de Blasio administration plans its appeals and is likely to move to dismiss legal action from James in the future. Mayor Bill de Blasio, a political ally of James and James’ predecessor as Public Advocate, is also not ready to accept the Public Advocate’s blanket ability to sue the city. “I think it’s case by case, that’s my understanding,” de Blasio said Sept. 6 when asked by Gotham Gazette at a news conference about the most recent decision. “That was not a blanket assessment, that was about that case,” he added. James doesn’t agree with de Blasio though. "By its very nature, a judge's ruling sets precedent for the future and this most recent decision affirms the Public Advocate's capacity to sue to protect the rights of New Yorkers,” the public advocate said in a statement to Gotham Gazette. Future cases will either cement the litigious powers of the office or not. Meanwhile, former office holders and legal experts are mixed on the extent to which the Public Advocate can litigate against the City. The two court rulings that have bolstered James, though, were delivered in August in separate lawsuits initiated by James against the New York City Department of Education and the City of New York. They affirmed and reinforced the legal capacity of the Public Advocate to sue the city. The most recent decision came on August 30 when a New York County Supreme Court judge issued a ruling on the viability of a lawsuit brought by James against the Department of Education over the lack of air-conditioning on school buses for students with disabilities. The court found that the Public Advocate’s mandate “would include an obligation to explore a serious health problem affecting disabled children of the City and attempt, with the help of the Court, to remedy that problem.” It held that the case could move forward since James had the legal capacity to sue, which the de Blasio administration had argued against in seeking to dismiss the case. A Law Department spokesperson confirmed that the City will appeal the court’s decision that favored the Public Advocate’s right to sue on behalf of New Yorkers and in conducting the office’s duties. “The DOE is committed to ensuring air-conditioned buses to all students who require them and that any concerns are immediately addressed," the spokesperson said in a statement. Earlier, on August 11, James hailed another court decision that found her office could compel the DOE to respond to her concerns over its failure to effectively track the needs of students with disabilities in the city’s school system. These are only the latest in a number of judicial decisions over the years that have in turns enhanced the powers of the Public Advocate and also defined the limits of the office’s jurisdiction in certain cases. James’ litigation, largely aimed at the de Blasio administration, puts the mayor and former public advocate in the unique position of regularly opposing his successor’s claims and even right to sue. The current dynamic is also the first time in the history of the Public Advocate office that the Mayor and Public Advocate are of the same party -- de Blasio and James are both Democrats. Public Advocates have often used litigation as a tool to take the city and its many agencies to task, and in doing so have managed to expand the jurisdiction of the office, which remains unchanged in the City Charter. The charter does not expressly give the public advocate the right to bring a lawsuit, but it does not forbid it either. Mark Green, the city’s first Public Advocate, depended on his experience as a lawyer to bring suits against the City. During his tenure, he won two major victories that established precedent for the Public Advocate’s capacity to bring legal action. James has cited these rulings in court to push back against the City’s attempts to dismiss her cases. The first was Green v. Safir in 1997, in which Green sued then-NYPD Commissioner Howard Safir for access to the police department’s disciplinary case files for officers with substantiated complaints against them. An appellate court that ruled in Green’s favor held that he had standing to do so to further an investigation. In the second case, Green v. Giuliani in 2000, the public advocate sought a judicial inquiry into then-Mayor Rudolph Giuliani for disclosing information from the sealed juvenile record of an unarmed African-American man who was shot dead by an NYPD officer. The New York County Supreme court stated in that case that the Public Advocate is an independently elected official with the capacity to sue. In a later case involving Long Island College Hospital, which was initiated by de Blasio when he was Public Advocate, the Kings County Supreme Court ruled that the Public Advocate had the right to intervene and help choose the next operator of the facility since it was in the community’s interest. The case was inherited by James. Over the course of several public advocates, the office has, however, hit walls in certain instances, showing the limits of its power. When former Public Advocate Betsy Gotbaum sought to intervene in a legal dispute involving the Metropolitan Transportation Authority (MTA), a court ruled that she did not have the capacity to challenge decisions made by a state entity. And when Public Advocate James tried to compel the release of grand jury transcripts in the Eric Garner case by suing then-Staten Island District Attorney Daniel Donovan, she was denied on the grounds that her charter duties do not extend to criminal investigations. There have been other lawsuits that James has been involved in that were also unsuccessful, wherein she either withdrew or was dismissed. The Public Advocate office over the years has been defined by its holder and each has opted to use litigation as a tool, to varying degrees. The office has a relatively small budget, which was actually cut under Mayor Michael Bloomberg and partially restored since de Blasio has been Mayor. Some have called for the office to receive so-called independent budgeting wherein it receives a set percentage of the overall city budget and is therefore not susceptible to an unfriendly mayor or City Council. James has been more active in her use of litigation. Now in the third year of her first term, she has been a plaintiff in 11 lawsuits so far and filed numerous amicus briefs in other cases. In contrast, de Blasio initiated only three suits while he held the post for one term, according to a spokesperson for the public advocate. James has brought to bear her experience as an assistant attorney general and public interest litigator, initiating action on the behalf of members of the public to challenge the performance of city agencies. She said she has redesigned the office of the Public Advocate, raising awareness of its role and capacity in advocating for New Yorkers through a three-pronged approach. “When I was elected, my vision was advocacy work, litigation and investigatory work,” James told Gotham Gazette. Feeling good about the advocacy and litigation efforts thus far, she said, “In my next term, I want to advance the investigative power of the office including forensic audits to determine the effective of city agencies and programs.” James is up for reelection in 2017. She points to the victories won by Green and de Blasio as affirmation of her office’s broader ambit, and is bolstered by the recent decisions in her favor as evidence of the effectiveness of litigation. Following the August 11 decision, she told Gotham Gazette, her office is better placed to bring legal action that could also be recognized by higher courts. “I would imagine that a lot of judges will look to that as paramount to our ability to bring lawsuits,” she said. The de Blasio administration has attempted to stymie many of James’ lawsuits by arguing that cases be dismissed because they are out of the Public Advocate’s purview. It was the same tactic that de Blasio was on the other side of in the Long Island College Hospital case. Judicial decisions show that the office’s charter-mandated authority is open to interpretation even if its architects did not intend for it to be so. The City Charter establishes the role of the public advocate in monitoring city agencies and their response to complaints from the public; proposing means of improving response to complaints; and fielding, investigating, and redressing individual complaints as well. But Eric Lane, dean of Hofstra Law School, doesn’t believe the Public Advocate’s duties can be interpreted broadly. Lane was executive director and counsel to the New York City Charter Revision Commission between 1986 and 1989 and oversaw the very provisions that established the powers of the public advocate. Lane said the Public Advocate’s job should be to oversee and report on the system, to be the “public critic” who should only use legal action to further the completion of his or her duties. “I agree that [James] has the right to sue to gain access to information to allow her to fulfill her oversight obligations under the Charter, but I don't believe that Charter provides the Public Advocate with the authority to sue ‘to protect the rights of all New Yorkers,’” Lane told Gotham Gazette, referring to a statement put out by the public advocate’s office after the August 30 ruling. “I think this is inconsistent with the Charter scope of her job and problematic,” he said.